I flew back from SIN this week on an EK A388 after my QF A333 flight was delayed over twelve hours. Chalk and cheese, I'd do EK A388 metal any time over any QF, cost permitting. The QF SIN-SYD A332 flights have recently appeared on one particular OLTA site when searching for the cheapest Biz class Europe-SYD flights (eg AMS-ZRH-SIN-SYD). So QF might be pricing the sector to reflect the quality. Can anyone deny / confirm ? My booking in Feb still showing older cabin. As of January 25th HNL is now being operated by the A330-300 which will have the new J class cabin interior. This is due to the A330-200 being deployed to PEK. It fits in nicely with QF127/128 flights, so it appears on some, not all, days that the old 332s are being rotated thru SIN. I flew on a converted A332 yesterday in J . ( only SYD-MEL) and I was impressed. Nice finish and everything where it is needed. I would like to try it out on a night flight sometime. I'm a regular in the J cabin on the EK A380 and the QF A332 is a big improvement. Hope they refit the QF A380s soon. Well done QF. 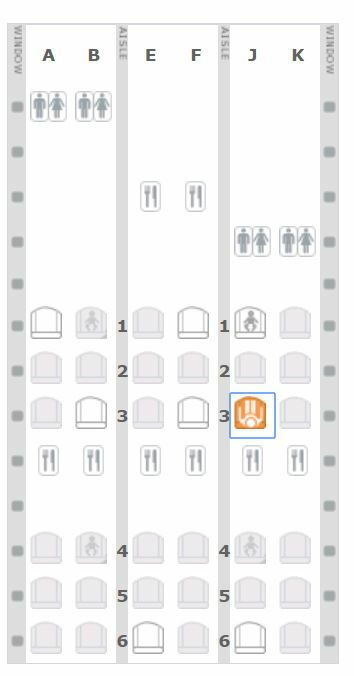 Haven't seen one of these configurations in a while (international flight). Thought all birds had been refurbished? Either VH-EBG or EBL, the two remaining of the initial international 332 fleet. But do occasionally end up elsewhere when a 333 goes to Beijing. The refurb of a group of the 332's was reportedly going to commence this month; has anyone seen/heard any news concerning this? Was VH-EBG. Reminds you how nice the refurb is. VH-EBN landed in BNE this morning as QF6013 havig just been repainted into the new livery in SIN. Actually, I would have thought EBG/L will have to wait until at least a few of the others have been done? The reason they are still in their present state is that that are required for some longer-haul Asian routes, and QF cannot afford for either of them to be unavailable for 3-4 weeks until there are suitable substitutes. agree they need at least two 332s for the PEK route before they can refurb G/L. However EBN back into service today. EBL has annoyingly been going to HKG these last few days. I got caught out.